You can change the decor in a room quickly by painting. However, if you have wallpaper on the wall, that's a different story. It takes a long time to take wallpaper down. You can skip this step by painting over the wallpaper. This cuts out the long wallpaper removal process. You just have to prepare the wallpaper for painting. This takes just a few steps and you are ready to paint. 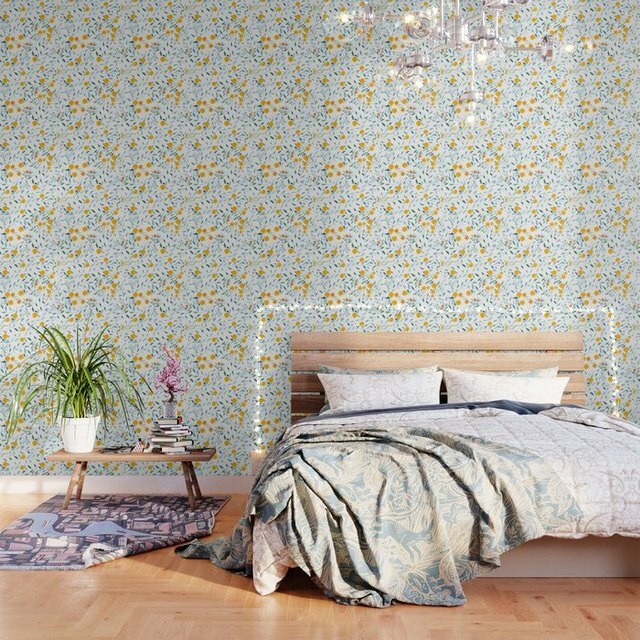 Yes, you can paint over wallpaper -- with careful preparation. Check your wallpaper edges and make sure there are no loose edges or seams. If there are, put a bit of wallpaper adhesive under these spots and edges with an artist's paintbrush and press down to adhere back to the wall. Let dry according to the directions on the adhesive. Wipe down your walls with a damp sponge to remove all dirt, dust and old wallpaper glue at the seams. Let dry before proceeding. Remove all the switch plates and outlet covers. Put them in a bowl with all of the screws so you don't lose them before it's time to reinstall them. Feel the wall all over with your bare hands to find any dents or scratches that need to be repaired. Use a surface filler such as spackle and a spackle tool to fill in these small places if there are any. Let dry and use fine sandpaper to smooth out these spots. Wipe dust from the sanding with a cloth. Tape off your window edges, ceiling edges and baseboard edges with blue painter's tape to keep paint off these surfaces. Place drop cloths on the floor. Stir the primer with a wooden paint stirrer. Apply the primer to the walls. This makes the paint adhere to the wallpaper. Let dry for 24 hours, to ensure the primer is completely dry before painting. After priming, if there are any blisters in the wallpaper, slit them down the center of the blister with a utility knife, apply wallpaper adhesive under them, and press to glue the paper back to the wall. Let the glue dry. Wipe excess adhesive off with a damp cloth and let dry. Stir the paint and apply to the walls. Let dry for 24 hours. Reinstall the outlet covers and wall plates. Remove the painter's tape from all the edges. You may have to apply a second coat of paint for complete coverage. If the wallpaper is very old, first do a primer test patch of about one square foot to see if the wallpaper lifts from the wall after the primer is applied. If it does, the wall paper is too brittle to paint and will have to be removed. Anita Billings has been writing since April 2009. Hundreds of her articles appear on eHow, with expertise in piano, decor, landscaping, crafting and travel. Billings received a diploma in business merchandising from King's College in 1974.